The Models 3024 and 3028 piezoelectric accelerometers exhibit a nominal transfer sensitivity of 12 picoCoulombs/g and are ideal for low to medium level vibration measurements. The internal construction of the piezoelectric seismic system ensures that the units have no discernible spurious response to mounting torque, body strains, cable vibration, cable whip, pressure variations and most heat transients. The units incorporate a shear crystal-mass assembly, which ensures that the sensor is insensitive to environmental inputs such as base bending and thermal transients. 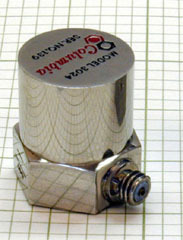 The unitsdiffer in their connector positions (side or top) and isolation resistance. Each model is supplied with a 10" low-noise coaxial cable. High temperature units will operate in environments up to +500 Deg. F. Consult the factory for customized versions of these sensors. 0 (Case Grounded) 100M Ohm Min.